Kate Rosenberger hopes to spend most of her time at her new 24th Street bookstore. Drawing by Robyn Dalbey. Kate Rosenberger is not crazy. Some may think she is, given that in the era of e-books, she’s just opened a second used bookstore in the same neighborhood. 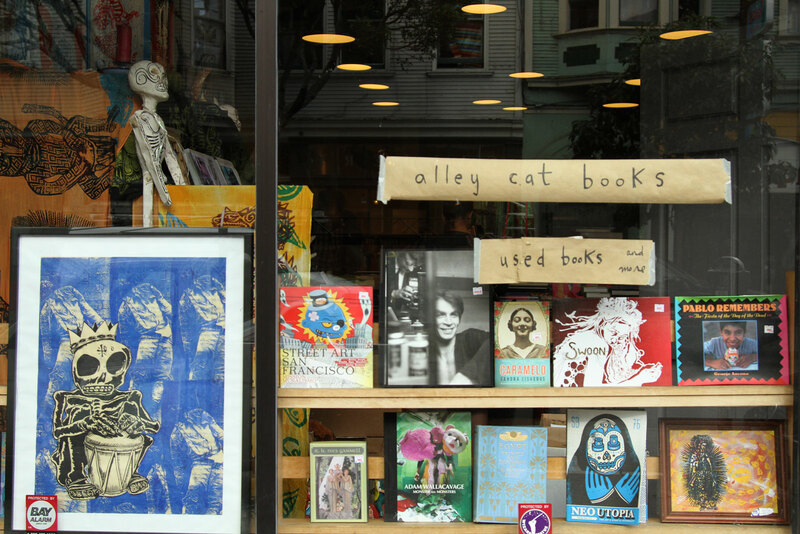 “My romance is with the used book — the stories they come with, the inscriptions, the ephemera … the smells,” says Rosenberger, the owner of Dog Eared Books at 900 Valencia St. and now Alley Cat Books at 3036 24th Street. Readers like used books, she adds, standing in the middle of the newly stocked store, because they’re cheaper and more interesting. Rosenberger’s favorite new read is “Why Aren’t you Smiling.” It’s just so funny, she says of the book by Alvin Orloff, who managed Dog Eared Books for many years. Alley Cat officially opens on Dec. 2, and although Rosenberger’s still moving in, she’s already opened the doors to customers hungry for used books. Yes, she knows that bookstores are closing — San Francisco today has 12 fewer bookstores than in 2003 — and a recession can make any opening more difficult, but Rosenberger loves books. 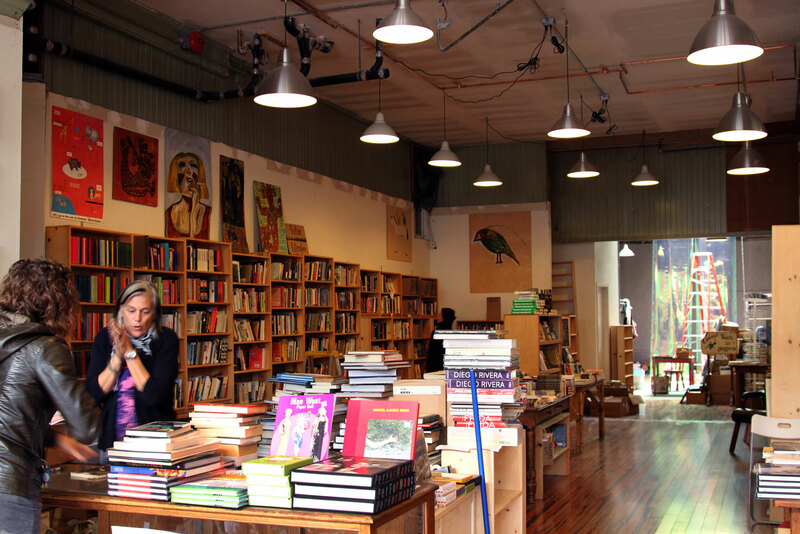 Since 1985, when she opened Phoenix at 3870 24th St., she’s opened a new bookstore every seven years — Dog Eared, then Red Hill at 401 Cortland Ave. All are doing well, though Phoenix is struggling to find its footing in its second Noe Valley location, across from Whole Foods. Her Mission store on Valencia, however, is having one of its better years. The place, formerly the Wizard Smoke Shop, had long sat vacant. Now, a bright green hand-painted sign hangs above the windows, reading simply, “Books.” After six weeks of work — taking out the dropped ceiling, removing the planks covering some of the windows and replacing the white linoleum with bamboo flooring — the space is beautiful. Sun pours in through the skylight above a back room that is still unfinished. She may make the area into a shared art studio or use it as a gallery. Another idea is to “share it with neighbors in need,” a kind of micro-lending. They could use it, she said, for monthly swaps of clothing, art supplies and food, for teaching kids practical skills — even for building things such as bee hives and chicken coops. Remodeling isn't quite done, but customers couldn't wait to buy books at Alley Cat. This is the seventh time she’s created a bookstore space — she’s moved two of her stores since they opened — but this is the first time she’s allowed herself to remodel it exactly as she wants. As always, she will also wait to see who comes in and what they want. The success of her other stores suggests that this strategy works for her. Selling used books, she says, requires her to anticipate what readers will want before they know it. To do this, she visits other bookstores “all the time,” to see what’s working and what’s not. Running used book stores, Rosenberger says, is something that found her. Her first retail experience with books was working at Half-Priced Books in Berkeley in 1984, after finishing a year of community college. Selling books, that simple interaction with people, helped her shed some of her shyness. She found that she really loved it, and thought, “I can do this.” She wanted to do it better, though. The local bookstore community is close-knit. Rosenberger is friends with the owner of three bookstores in the East Bay, and they bounce business ideas off each other. She sends people to Modern Times Bookstore down the street whenever she doesn’t have the new books they want. They sell new and she sells used books and mark-downs — at least for the time being, she says. As for her stores, “I am lucky in this,” she says, adding that some say she’s blessed and others say it’s her hard work. She reads a lot of books about bookselling, like “Reluctant Capitalists: Bookselling and the Culture of Consumption,” by Laura J. Miller. It’s true, she says, referring to the book — in order for a book shop to survive, it must at least break even. 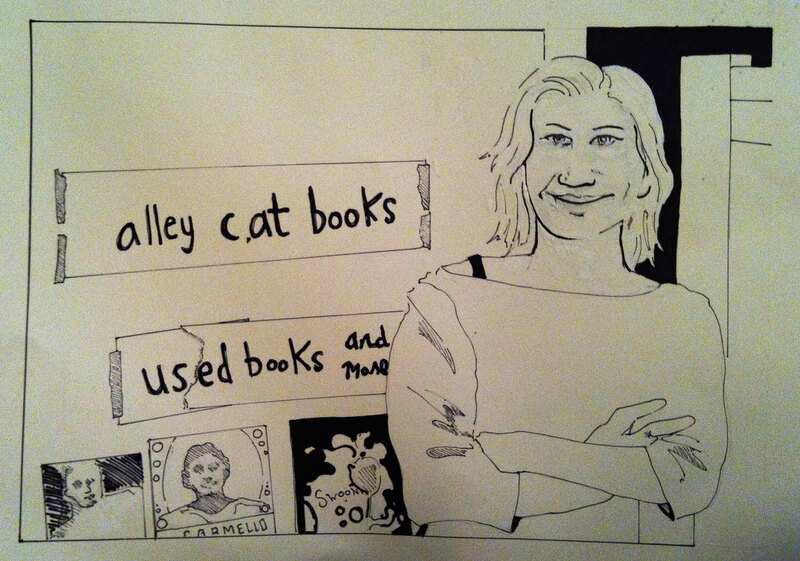 Alley Cat Books’ opening party is Dec. 2, during the First Friday on 24th Street Festival. 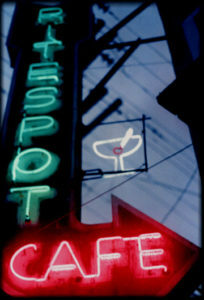 The store will also be open for MAPP on Dec. 3.